The kind of unrest seen in the Arab world is familiar to many Kyrgyzstanis. But the hard work comes after revolution, says Erica Marat. The recent unrest in the Middle East and the Arab world has obviously meant the issue of transitioning from an authoritarian regime to democracy isat the forefront of many people’s minds. How is all this being seen in Kyrgyzstan? In Kyrgyzstan, the attitude towards what happened in Tunisia and Egypt is something like ‘been there, done that.’ A lot of Kyrgyzstanis who see what’s going on in the Middle East today feel that their country has already experienced violent regime change and popular unrest under an authoritarian regime. Also, a lot of Kyrgyzstanis understand that toppling a corrupt regime is actually one of the easier parts of a revolution—what comes after is much more difficult. 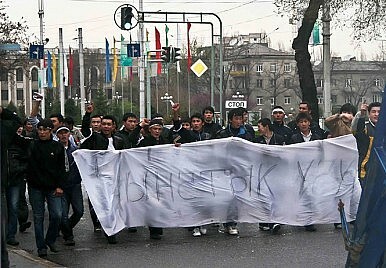 There have been two violent regime changes in recent Kyrgyz history: one in 2005 and one in 2010. The one in 2005 didn’t turn out as many hoped: Kyrgyzstan didn’t become a democratic state, and instead actually became a very authoritarian state. This led to further regime change in 2010. Today, a lot Kyrgyzstanis are very sceptical about what will happen in the near future because they already know how politicians who come to power on the basis of pledges to fight corruption and build democracy can actually become authoritarian themselves. Kyrgyzstan captured global media attention last year after protests resulted in the toppling ofPresident Kurmanbek Bakiyev. What’s been going on since then? Kyrgyzstan has seen some really dramatic changes in the past year. Last April, an authoritarian and corrupt regime was ousted following mass demonstrations. Since then, Kyrgyzstan has adopted a new Constitution, has changed the political system from a presidential one to a parliamentary one, and has also conducted free and fair parliamentary elections—for the first time in Central Asia’s history, parliamentary elections actually reflected the people’s will. However, Kyrgyzstan also saw some very ugly ethnic violence in 2010, when the Kyrgyz majority attacked the Uzbek minority in the south. The process of reconciliation has been difficult and very slow. We still don’t have an official indication of how the conflict began, how it proceeded, and who should be held accountable. Nevertheless, the parliamentary government now has much greater power compared with a year ago, and has been learning to function in this new environment, coming up with coalitions and working in a more transparent system. So the past year has been very difficult for Kyrgyzstan. But this year is going to be particularly important, because presidential elections will be held. This means that depending on who runs for president, we’ll either see continuity of political reform and the strengthening of the parliament, or we’ll see the opposite, with the president trying to claw back power. Sino-Turkmen energy cooperation gives Beijing greater maneuverability in navigating the treacherous geopolitics of the region.